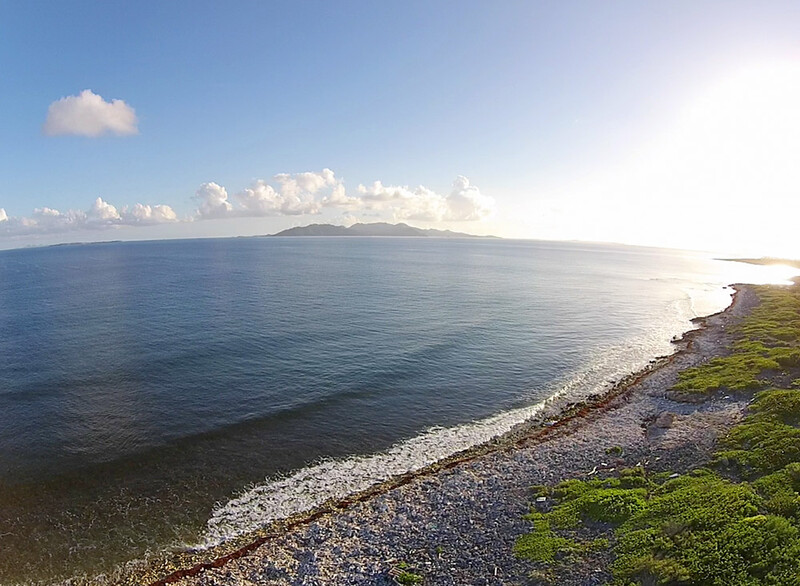 Set at the edge of the Caribbean Sea on 0.75 acres of oceanfront in a quiet residential neighborhood, a peaceful piece of paradise awaits. 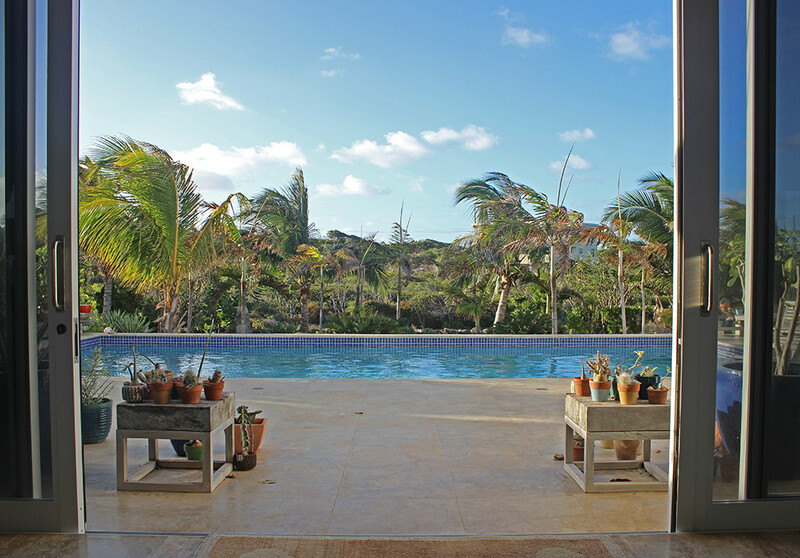 With unobstructed views of St. Martin, St. Barths and the open Caribbean Sea, 6,000 square feet of outdoor and indoor living space and a tailor-made pool, Anguilla Beaches Villa brings comforts of home to a tropical Caribbean escape. Genuine Anguillian stone underfoot. Vaulted ceilings overhead. 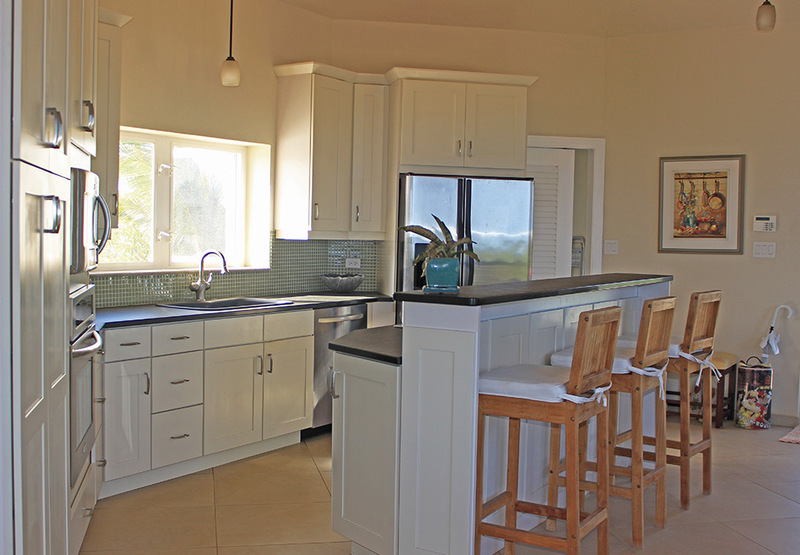 Architectural designs that capture both unique views in each and every room and refreshing easterly West Indian trade-winds. 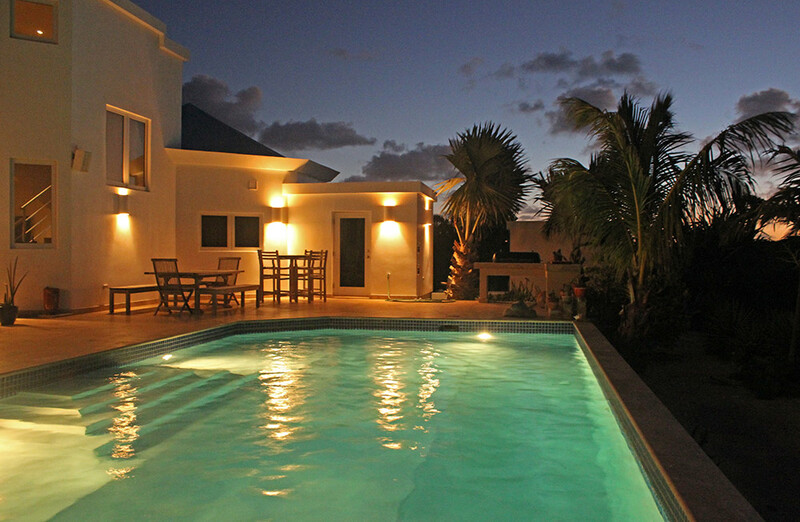 You are immersed in Anguilla's beauty every step inside Anguilla Beaches Villa. The spacious kitchen, complete with granite counters and high quality appliances, makes plenty of room for "many cooks in the kitchen." Whether entertaining or preparing dinners in, space is well afforded. Opening into a wide dining area with ample daybeds (for post-meal snoozes), in-villa dining is most relaxing, complete with gentle Caribbean trades wafting in from the sea. Embracing natural beauty is a theme throughout. Natural light pours in through sea-facing windows and the villa's breeze way, complete with its floor-to-ceiling glass sliding doors. A favorite place to sit, nap and work while enjoying the trades, with the sea to one side and the pool/garden to the other, the breeze way itself is, in one word, blissful. It's hard to find a corner of the home without a view. 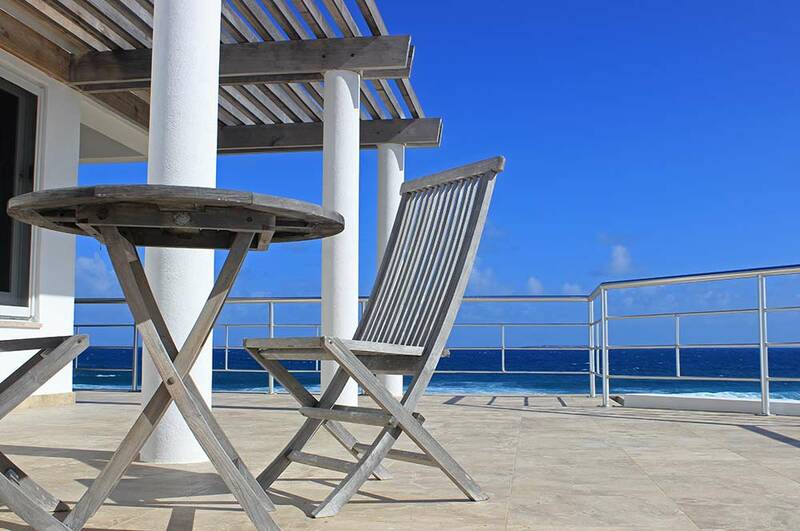 With an octagonal structure, optimized for capturing Anguilla's scenery, Anguilla Beaches Villa features three unique "snapshots" of the open Caribbean Sea, St. Barths and Tintamarre and St. Martin. No view is obstructed and each is more breathtaking than the next. The villa's eco-friendly, ICF construction (which re-buffs temperatures) and its perfect positioning, designed to catch sea breeze, keeps the villa fresh. 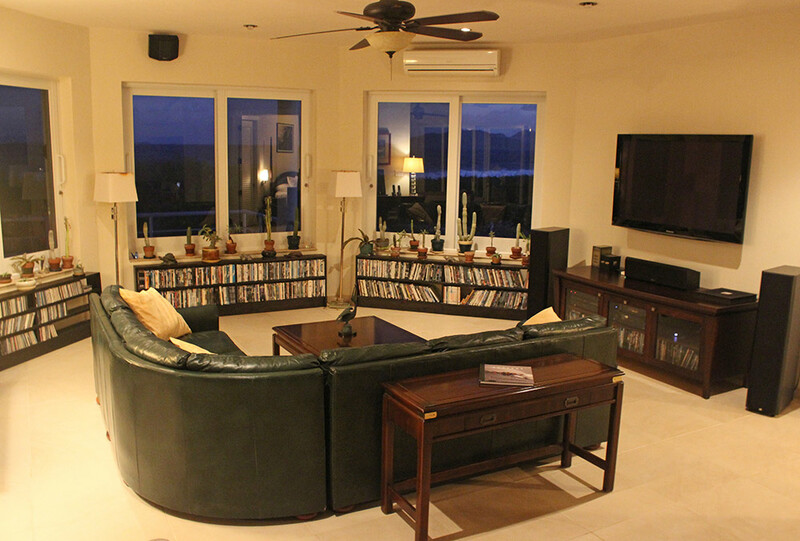 Even on the hottest day when it may be 90F/34C in The Valley, the island's capital, the villa remains comfortably cool. There is no need for air conditioning, though it is available if desired. Self-sufficient, the villa also features two cisterns, one fed and purified by the massive roof and terraces, the other a gray cistern used for irrigation. Moreover, in place of a standard septic tank, the villa has a sewer treatment package, allowing water leaving the sewage treatment package to be used for irrigation. Every drop of water is preserved and saved. 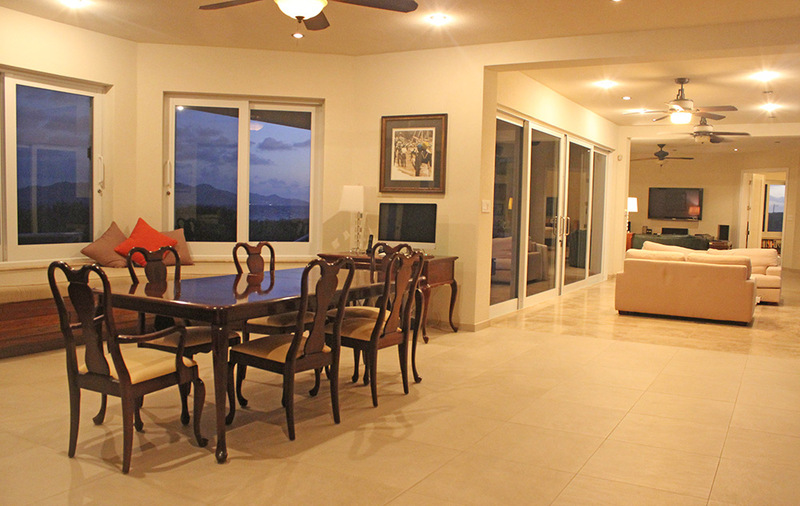 Modern features and materials of the highest grade complement the property's natural beauty. Satellite-TV ready, with a 60" Plasma Screen television, Blu-Ray player and 7.1 surround sound make for one of the top home theaters on the island. Includes over 1200 BluRay and media server delivered digital movies. 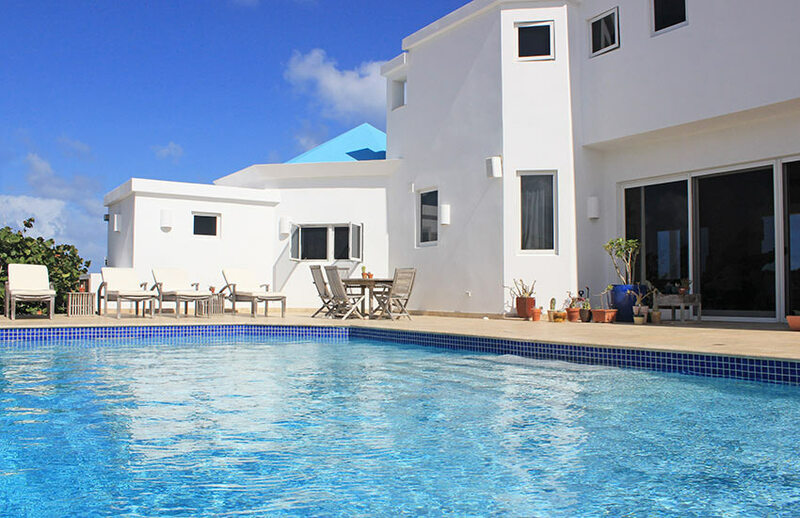 The only Anguilla villa with Fiber Optic delivered straight from the Internet Service Provider, the bandwidth is off the island's network and is the most reliable and of the highest speed at up to 100mbps, depending upon your needs and desires. 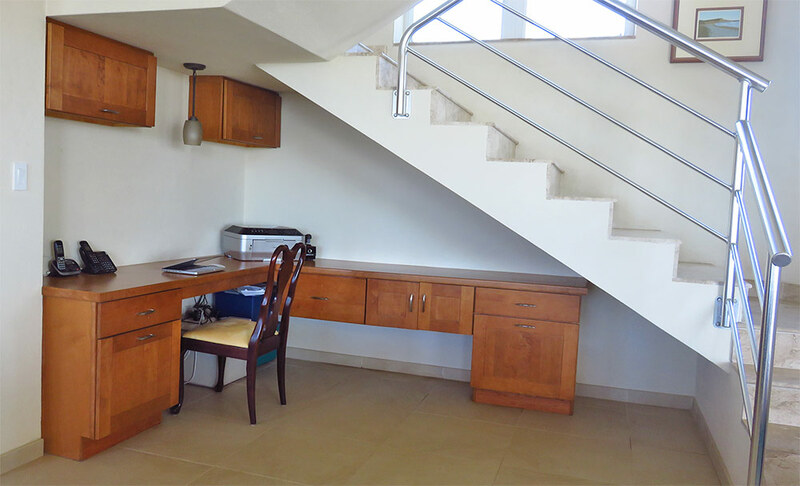 The Apple wireless network throughout the villa allows for WiFi to be enjoyed on both stories, all terraces, and in two work spaces (one in the dining room and the other adjacent to the home theater, complete with printer/scanner) for more "serious" business. When it's time to disconnect? Stroll from your front door along the coastline, dotted with tidal pools, rich in tropical fish. Garden with an irrigation system that makes landscaping completely customizable. Take a dip in the custom-built pool sheltered from the breeze. Sun and read on any one of the villa's three spacious terraces. 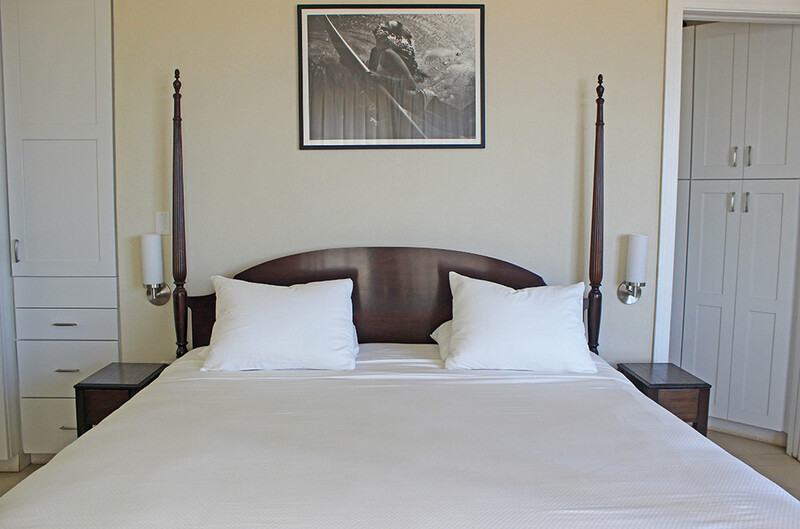 At the night's end, retreat to one of the villa's two suite-style bedrooms. 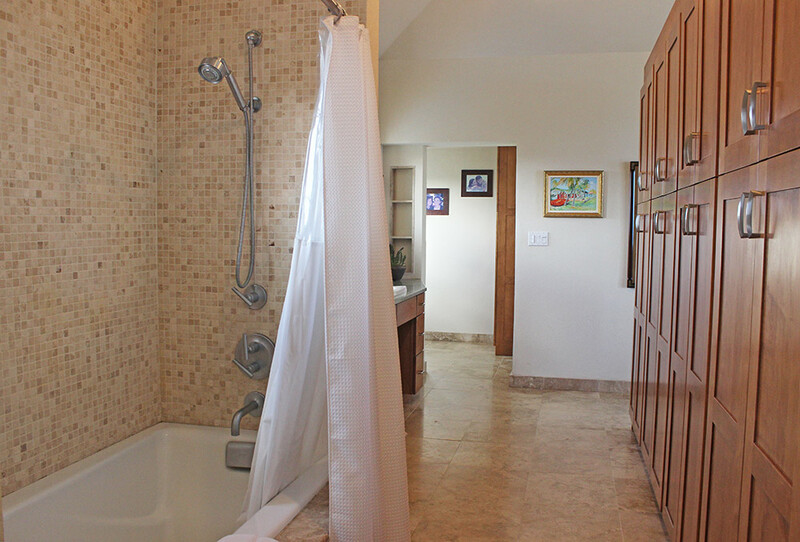 Each bedroom boasts top-of-the-line American-made cabinetry and bathrooms complete with tumbled Travertine showers. Luxurious outdoor shower offering views of St. Barths. 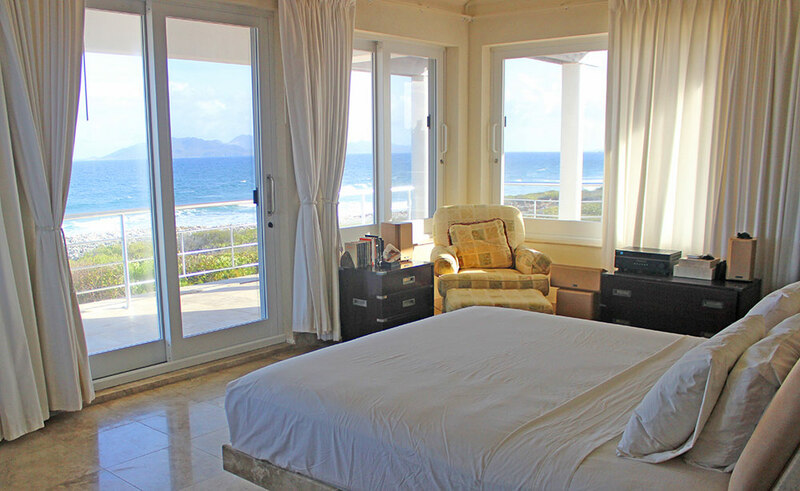 180° bedroom view providing unparalleled views of Anguilla's surrounding islands and azure seas. As you kick back in your king-size bed made of genuine Anguillian stone that melts into the matching tiles, the night lights of St. Martin come on; your own personal nightlight, while the rhythmic lapping of the water below lulls you to sleep. 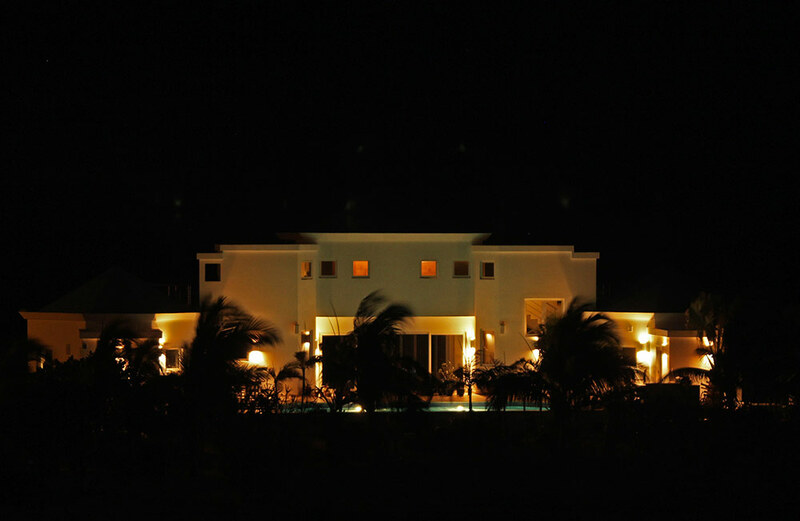 Sleep soundly, knowing that Anguilla Beaches Villa is safe and secure. The villa was anchored all the way down to bedrock and then built several feet higher, above 100 year hurricane surge levels. 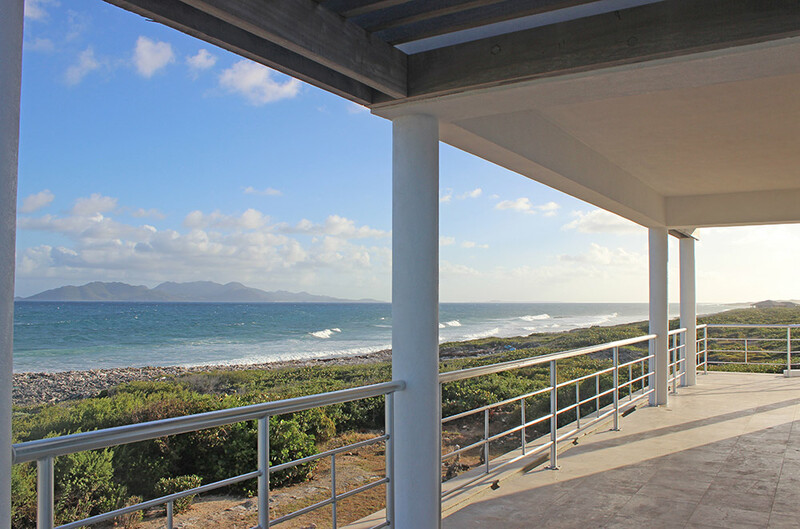 Anguilla Beaches Villa is a rock, built to ensure stability and security in the event of storms and hurricanes. Its PGI WinGuard windows and doors (Miami Dade Hurricane-5 Certified), make it the only Anguilla villa with no-need for hurricane shutters. An FG Wilson generator (located in a separate generator building) switches on automatically should the electricity go out. Able to power the entire home, running every appliance for a week (24x7), you are completely covered in power outages. 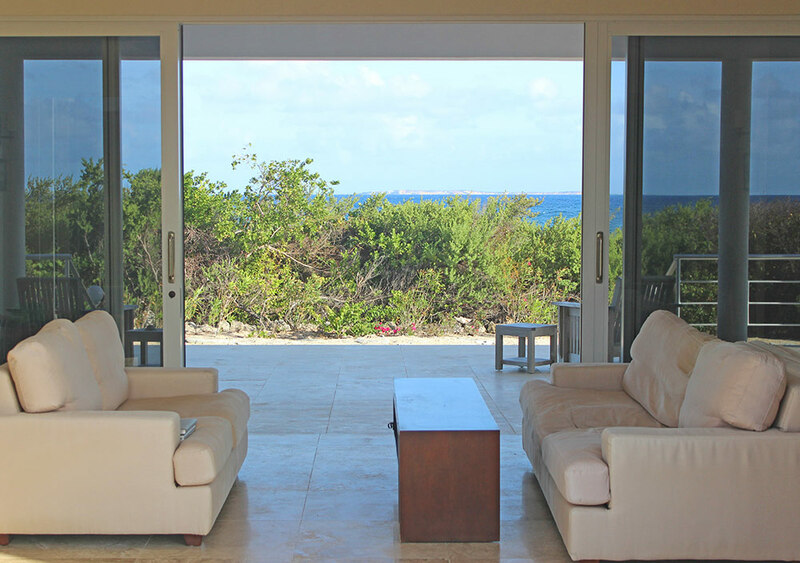 Built for comfort and basking in Anguilla's natural beauty, at Anguilla Beaches Villa you can sit back, relax and take it all in. a "village" of only 13,000, Anguilla quickly becomes "home"
income-tax-free, savings amount to millions of dollars over the years (if you plan to establish residency). We welcome you to our little-known village of the Caribbean (more information at Anguilla-Beaches.com).